VuPoint Digital Photo Converter | OhGizmo! By Andrew Liszewski on 08/15/08 • Leave a comment! 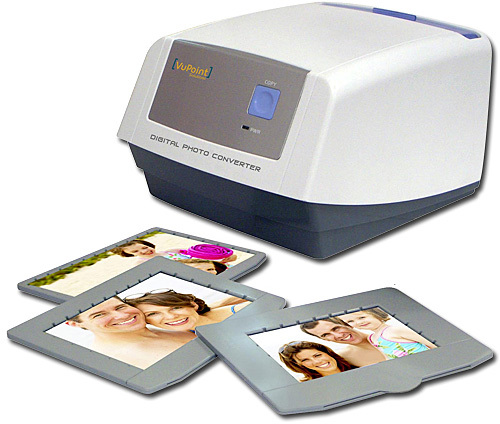 If you’ve got a shoebox or album full of old photos that you want to digitize, but for some reason don’t want to go to the scanner route, the VuPoint Digital Photo Converter provides a somewhat easier solution. You just place your photograph on one of the included trays (they come in various sizes for photos up to 5×7) and then slide it into the converter. Instead of a moving scanning head, the VuPoint uses a 5 megapixel digital camera that allows for up to 1,800 dpi and 10 bit color. While the converter can automatically deal with exposure and color balance, it does come with additional software (XP & Vista only) for more advanced tweaks or cropping and resizing. At $149.98 from Taylor Gifts it’s a bit more expensive than the cheapest scanners on the market, but I guess they’re mostly selling ‘ease-of-use’ with this thing.